The gold-mining sector is on the verge of flashing the fabled Golden Cross buy signal. This is one of the most powerful and revered indicators in all of technical analysis. When it arrives after the right conditions, it flags the critical transition from bear to bull markets. And today’s gold-stock environment is perfect to spawn such a pivotal Golden Cross. Seeing this milestone will accelerate capital flows back into gold stocks. Technical analysis is derided in some circles, which is understandable since much of it is subjective. But there is simply no doubt that many traders buy and sell based on technicals, which certainly makes the interpretation of price action a self-fulfilling prophecy at times. Stock-price levels also greatly affect both sentiment, which drives the lion’s share of buying and selling, and even fundamental valuations. A golden-cross chart pattern occurs when a shorter-term moving average that was below a longer-term moving average climbs back above the latter. There is no judgment at all involved in such an event, it is a function of the hard math of calculating moving averages. When a faster moving average crosses back above a slower one after a long price decline to major lows, it usually signals a major trend change. While any such positive moving-average crossover can loosely define a golden cross, only the most popular one elevates this event to capital-letter significance. That’s when the 50-day moving average climbs back over the 200-day moving average. 50dmas and 200dmas are very important for analyzing price action, as they nicely distill medium-term and long-term price volatility into simple directional trends. On a day-to-day basis, stock-price movements often look very erratic. They rally big one day, so traders get excited. And then they fall back the next day, so traders get worried. This almost-random short-term volatility effectively masks the longer-term trends in place or developing. 50dmas and 200dmas smooth out this often-excessive daily noise to expose the underlying trend so traders can grasp the big picture. This smoothing function also helps keep dangerous greed and fear in check, which is especially important in the gold-stock realm. Few sectors are more volatile, with 3%+ daily swings in the leading gold-stock index and ETFs actually common. Gold-stock traders overreact often, leading them to buy and sell at the wrong times, because they myopically get caught up in the past few trading days’ price action. Watching these key moving averages greatly tempers the undue sentiment influence of short-term price action, short circuiting the psychological tyranny of the present. And the picture painted by the gold-stock sector’s 50dma and 200dma today is far different from what this week’s pullback suggests. This is readily apparent in any gold-stock index, but I’m going to use the flagship GDX gold-stock ETF today. Van Eck Global launched its GDX Gold Miners ETF almost 8 years ago, and it has grown into the definitive gold-stock trading vehicle for many individuals and funds. It owns 36 of the world’s biggest and best gold and silver miners, offering instant diversified exposure for investors. Due to how its component stocks are weighted, GDX is even superior to the traditional HUI gold-stock index in some ways. GDX is rendered in blue in these charts, with its key 50-day and 200-day moving averages shown in white and black respectively. At their current rate of convergence, GDX’s 50dma should surpass its 200dma the trading day after this essay is published. This gold-stock Golden Cross is a very important buy signal for this battered sector, and an exceptionally powerful one given the preceding conditions. There’s no ambiguity whatsoever in a Golden Cross, this event itself isn’t subject to interpretation. Once the mathematically-exacting 50dma crosses back over the equally-precise 200dma from below, the Golden Cross triggers. And that is happening today in gold stocks. This is not only true of GDX, but the HUI gold-stock index, gold itself, and the HUI/Gold ratio. The GDXJ junior-gold ETF has already flashed a Golden Cross. These gold-stock 50dma/200dma Golden Crosses are pretty rare. Since 2007, the first full year of GDX’s existence, there have only been five before this latest one. That’s over a 7+ year span, so they occur well less than once a year on average. And only a single previous one emerged from similar critical background conditions as today’s for flagging a major trend change from an old bear to a new cyclical bull market. The most powerful Golden Crosses with very high odds of signaling massive gains in the following years are only born when several specific conditions occur. They have to happen after a long price decline. This serious selloff has to pummel prices to exceptionally low levels. And these low prices have to spawn dismal and hyper-bearish sentiment. Gold stocks just met all three of these important conditions to a tee. As a seriously volatile sector, gold stocks can suffer large corrections within ongoing uplegs. These work to bleed away excess greed and rebalance sentiment, keeping the upleg healthy and extending its lifespan. Occasionally after particularly larger or longer corrections, this sector’s 50dma is briefly dragged slightly under its 200dma. Then as the uplegs resume, Golden Crosses are technically triggered. This scenario describes three of the five previous GDX Golden Crosses since 2007. They happened when gold prices were high in ongoing uplegs, when sentiment remained bullish, and when the 50dma just shortly dipped slightly below the 200dma. These Golden Crosses too are usually solid buy signals, but only for a continuing upleg. They are not the Golden Crosses that can signal bear-to-bull transitions. Mid-upleg corrections never drive prices to exceptionally low levels, only full-blown bear markets can do that. And in general, the larger the price decline the longer it takes to run its course. This gives the 50dma lots of time to first fall under the 200dma and then plumb the depths below it. Incidentally, the 50dma crossing below the 200dma from above is called the Death Cross, the opposite of the Golden Cross. Gold stocks last experienced a Death Cross in January 2013, and this sector kept on falling afterwards. When occurring from high prices with rampant greed, these often signal a bearish bull-to-bear transition. Despite the wildly anomalous gold-stock carnage last year, that latest Death Cross did not meet the conditions for flagging a new bear. But that’s an entirely different subject for discussion in another essay. Back to Golden Crosses, cyclical bear markets are big enough and long enough to drag the 50dma far under the 200dma. The deeper the 50dma falls below the 200dma, and the longer the 50dma stays there, the more powerful the subsequent Golden Cross buy signal. And the sheer magnitude of 2013’s brutal gold-stock selloff certainly pushed GDX’s 50dma to exceptionally low levels relative to its 200dma. By mid-July 2013, GDX’s 50dma had sunk nearly 31% under its 200dma. This was truly exceedingly extreme. No other 50dma/200dma divergence even remotely close had been seen since deep in the dark heart of 2008’s once-in-a-century stock panic! And as of today, GDX’s 50dma has been under its 200dma for 14.2 months. This is the longest this secular bull has ever seen, dwarfing the stock panic’s 9.6 months. So the gold-stock selloff leading up to this new Golden Cross greatly exceeds the standard of occurring after an exceptionally long price decline. And it also left gold stocks at exceedingly low price levels. The longer a preceding selloff, and the lower the resulting prices, the more likely a Golden Cross is to signal the birth of a new bull market. And December’s epic gold-stock bottom hit off-the-charts price lows! In absolute terms, GDX slumped to just above $20 in late December. This was a 5.2-year low, the worst gold-stock prices seen since November 2008 in that crazy stock panic. And even during that wild maelstrom of selling that sparked the greatest fear levels most of us will ever see in our lifetimes, GDX only spent a grand total of 10 trading days closing under $20! The recent lows are as extreme as GDX can get. Even more importantly, at their December 2013 lows gold stocks had never been cheaper relative to gold in their entire secular bull market! In the markets stock prices are ultimately a function of underlying corporate profits, and in the gold-mining industry profits are dominated by the gold price. And back in December, the gold stocks were trading as if the gold price was at a small fraction of prevailing levels. These were truly fundamentally-absurd levels, as I discussed in depth at the time. That’s why we were buying these dirt-cheap gold and silver stocks then and advising our subscribers to do the same. They had never been cheaper fundamentally since late 2000, when their massive secular bull was born. So recently gold stocks certainly far exceeded the pre-Golden Cross condition of being exceptionally low. Only one thing can force stock prices to extremes far from underlying fundamental realities, and that is extreme sentiment. The bearishness in gold stocks was just astounding late last year, nearly the worst I’ve ever seen in decades of trading. Investors and speculators alike were universally convinced this sector was doomed to keep spiraling lower indefinitely. Fear and despair were just off the charts, truly extraordinary. And that more than satisfied the third condition preceding a Golden Cross that flags a critical bear-to-bull transition after a major reversal. We had a long price decline in gold stocks that pushed this sector’s 50dma far under its 200dma for a very long time. This price decline hammered gold stocks to exceptionally low levels. And these terrible gold-stock prices spawned truly horrendous hyper-bearish sentiment. So the odds are overwhelming that today’s Golden Cross signals we are now in a young upleg in a new cyclical bull market in gold stocks! This is very exciting and portends far greater gains to come than GDX has already enjoyed. If gold stocks have indeed transitioned from bear to bull, we’ve only seen the very tip of the iceberg of the capital inflows that are coming their way. So their prices are going to head far higher. 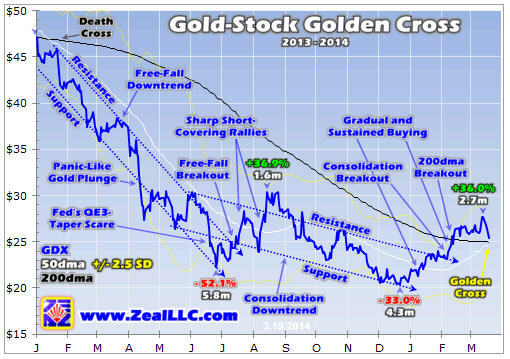 The only precedent in GDX’s entire history of a similar Golden Cross was after 2008’s brutal stock panic. Back then GDX bottomed in late October, amidst insanely low gold-stock prices and incredibly bearish sentiment. The great majority of then-existing gold-stock investors and speculators had capitulated, totally giving up on and fleeing gold stocks. Everyone susceptible to being scared into selling had already sold. But that leaves only buyers, and GDX indeed started to rally. Similar to January 2014, bearishness and skepticism of gold stocks remained very high in early 2009. Though GDX was surging much like it has early this year, its 50dma couldn’t claw its way back above its 200dma until late March 2009. That’s when the last gold-stock Golden Cross triggered that is even remotely comparable to today’s newest one. And after that Golden Cross flashed, the gold-stock sector would continue powering higher on balance for another 29.5 months! Of GDX’s utterly massive 307% bull run after the extreme stock-panic lows, fully 6/7ths of its total duration occurred after that March 2009 Golden Cross. And odds are that’s what will happen after today’s new Golden Cross too, that the gold-stock rally we’ve seen so far is just the start. Out of those extreme stock-panic lows, the major gold stocks as measured by the flagship GDX ETF more than quadrupled. That was an exceedingly profitable run for the brave contrarians like us and our subscribers who fought the herd to buy gold and silver stocks super-cheap during the stock panic. But even the less brave who waited for the Golden Cross new-bull confirmation still multiplied their fortunes. I suspect we’ll see similar outsized gains in the coming years, that the 36% GDX rally we’ve seen so far is merely the beginning. Gold stocks plummeted last year because gold did. Gold dropped because American stock traders abandoned the GLD gold ETF at an epic record rate, flooding the market with supply. American futures speculators joined them in fleeing gold, dumping gold futures at an also-record rate. But so far this year, American futures speculators have started buying gold again in a big way and are only half done at best. And American stock traders are starting to migrate back into gold via GLD, reversing last year’s extreme gold-ETF outflows to inflows. And gold’s new upleg will accelerate dramatically as the euphoric US stock markets inevitably roll over, when gold stocks are going to catch a massive bid. So as powerful as the gold stocks’ new Golden Cross buy signal is emerging out of recent conditions, it is backed up by strong global gold supply-and-demand fundamentals. Decades of trading have taught me the hard way to take a holistic approach, to consider technicals, sentiment, and fundamentals as an integrated whole. This new Golden Cross isn’t an isolated technical curiosity, but a small part of a big bullish picture. We were eagerly buying high-quality gold and silver stocks late last year when everyone hated them and their prices were the cheapest, resulting in short-term unrealized gains of up to +122% late last week. And these gains should only grow, it’s not too late to buy. The Golden Cross simply confirms the bear-to-bull transition that was already underway, and signals this bull run almost certainly has years left. At Zeal we’ve spent the past 3 months researching the world’s elite growing mid-tier gold producers. We gradually whittled them down to our dozen fundamental favorites, amazing companies that are likely to surge as gold recovers. All are profiled in depth in a fascinating new 32-page report hot off the presses this week. Buy your report today and learn about the best thriving and high-potential mid-tier gold miners! And profit from an essential contrarian perspective on the stock markets and gold through our acclaimed weekly and monthly newsletters. They draw on our decades of hard-won experience, knowledge, wisdom, and ongoing research to explain what’s going on in the markets, why, and how to trade it. Since 2001, all 664 stock trades recommended in our newsletters have averaged stellar annualized realized gains of +25.7%! Subscribe today and start forging the necessary buy-low-sell-high contrarian mindset to multiply your wealth. The bottom line is gold stocks are triggering a major Golden Cross buy signal. And this is happening after a long selloff hammered gold-stock prices to extreme lows fundamentally, spawning hyper-bearish sentiment. 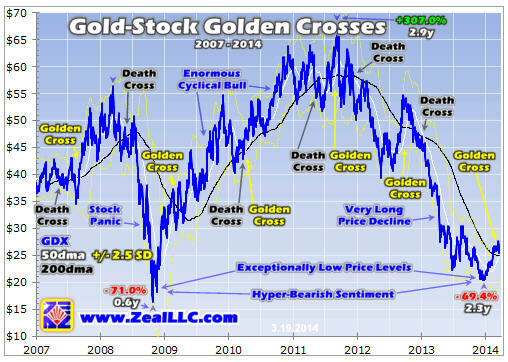 Thus there is a e last time similar conditions triggered a gold-stock Golden Cross was soon after 2008’s stock panic. And that major buy signal was an early herald of a massive upleg that ultimately saw this sector more than quadruple. Gold stocks are perfectly positioned for a similar great bull run today. Thankfully this newest upleg is still young enough that the lion’s share of the gold-stock gains are still yet to come.